Direct, uncomplicated, profuse flavor. I think oftentimes we miss so much by complicating our everyday, wasting time with artifice. Just look at the beauty of what’s around you, get real, honestly. Recipe? What recipe? 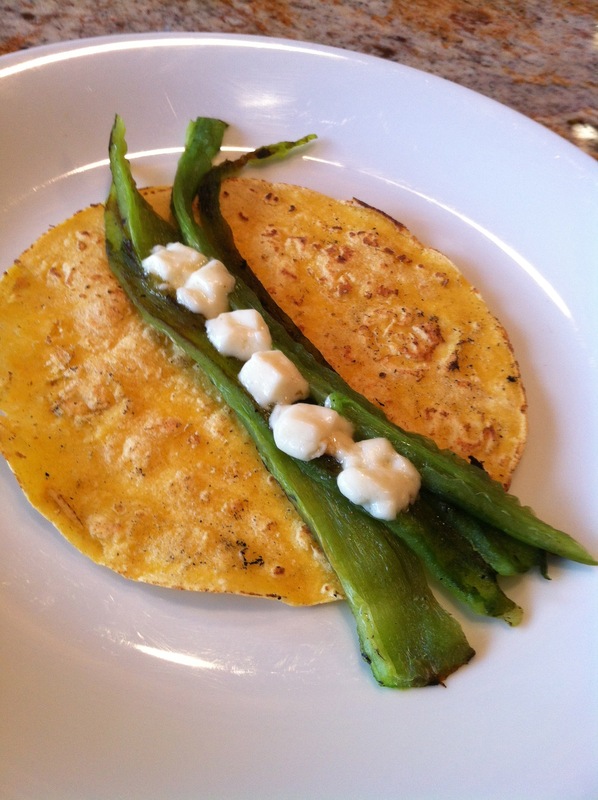 Roast the chiles, add salt and eat them with a yellow corn tortilla! Just kidding. Here’s the recipe, one that’s adapted from my cookbook: “Truly Texas Mexican: A Native Culinary Heritage In Recipes.” In the cookbook I also tell the history of Texas’ first food that dates back thousands of years. 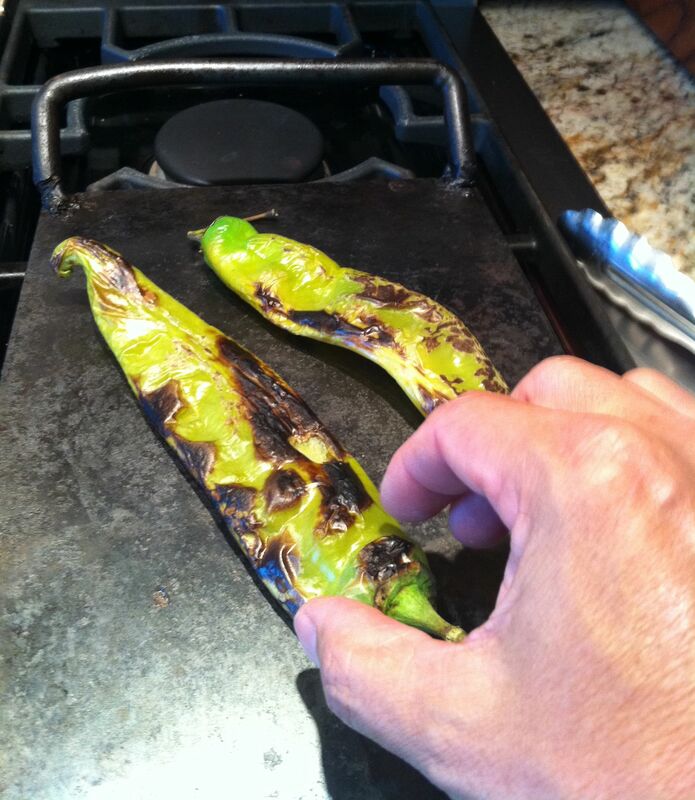 1.On a comal or cast iron griddle roast the chiles as shown above until most of the surface is charred. You can use a broiler or an open fire but I find that the extended time that it takes to char on the griddle is just right for cooking the inside of the chile. There’s still texture but it’s not firm at all. You don’t want to bite into a raw, firm chile. Let’s not get lost in the crudité 80’s again. 2. Place them in a paper bag and close tightly so that the steam helps release the skin. 3. When cool enough to handle, peel off the skin and remove the seeds. 1. In a shallow bowl filled with water, immerse the corn tortillas for about 30 seconds. I assume you have bought a package of yellow corn tortillas. If you want to make your own handmade tortillas, here’s the recipe and technique. 2. Heat a clean comal or griddle on high until it is quite hot, to the point that if you sprinkle droplets of water they dance on the surface and quickly evaporate. 3. 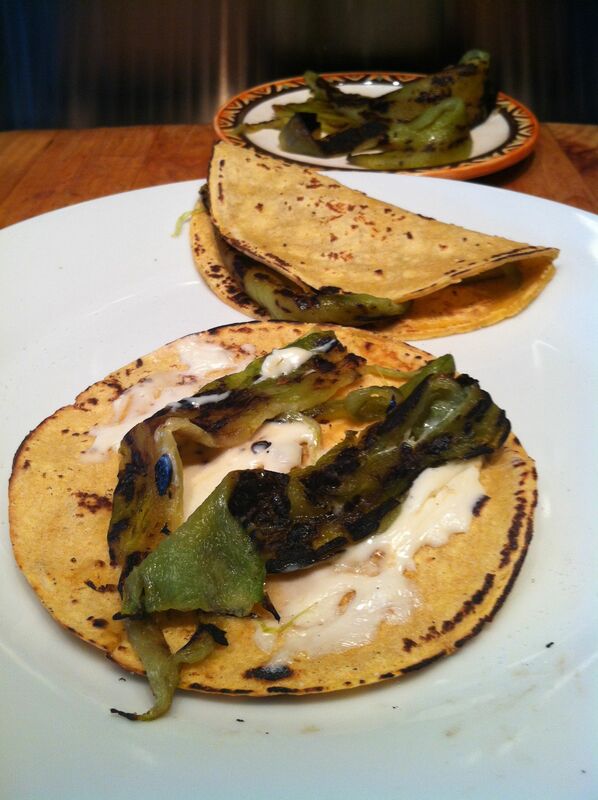 Place the re-hydrated tortillas on the griddle and cook for about 10-15 seconds. The tortillas should char just a little bit but you don’t want them to burn. Turn over with a spatula. 4. 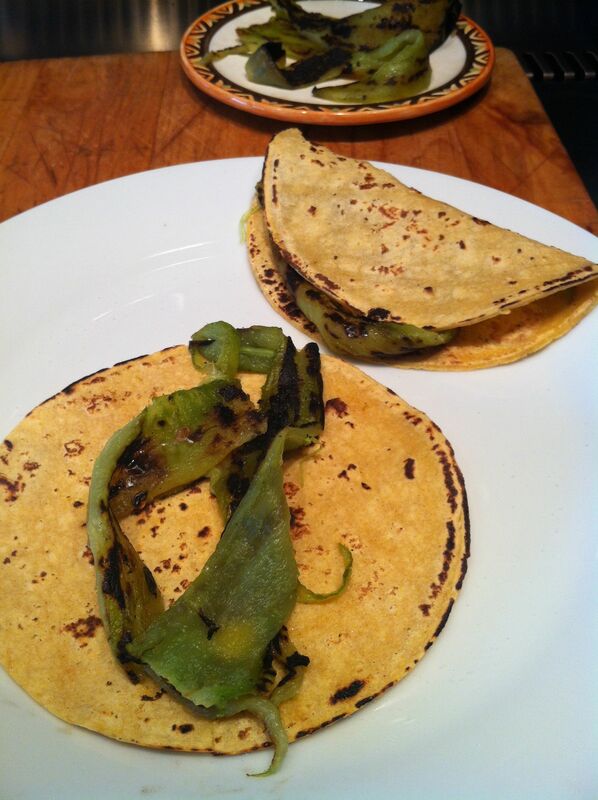 Place strips, rajas, of the chiles on one half of the tortilla, sprinkle with salt, and fold in half. Heat for about 15 seconds, turn it over and heat the other half of the tortilla. This roasts the tortilla and also reheats the chile nicely. 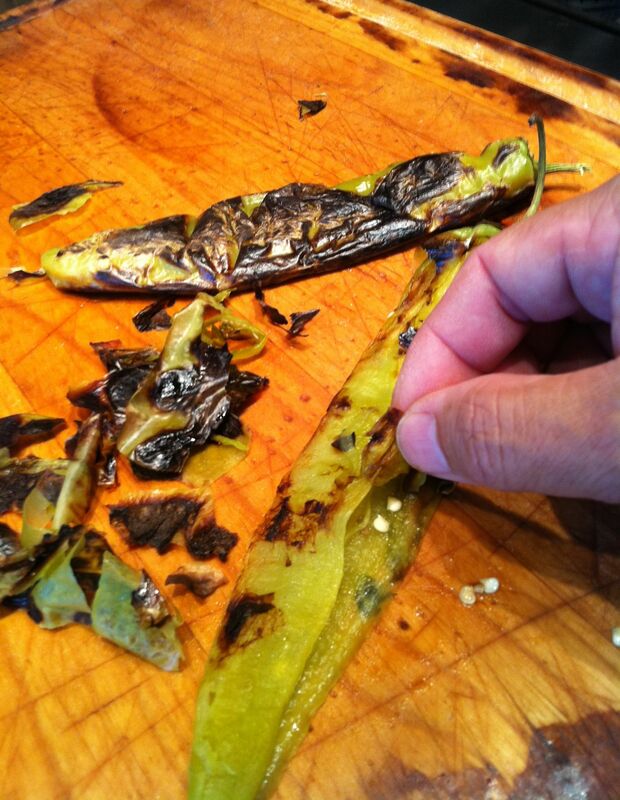 Roasted Anaheim chiles are very moist with bright flavor. Serve immediately, while they are aromatic and steamy. Ok, so it is also delicious with cheese. I recommend two cheeses, good melting Asadero and more delicately flavored Panela. Both I think are readily available in most grocery stores of the US. I wouldn’t use longhorn or cheddar. Too loud. Asadero cheese melted with roasted Ahaheim chiles. Add the cheese after sprinkling the salt on the rajas as indicated above, then fold the tortilla and proceed, also as above. Both cheeses will melt well, but differently. Here is the Asadero cheese. It melts completely and is a bit more present in flavor than the panela but still very nice and gentle. Remember that we want to taste the shades of flavor of the chile itself. And below is the Panela cheese. It’s a very different taste and texture. Cut into small dice, it will melt slightly as you can see. Oh, my goodness…..toothsome. Leave a comment and let me know how you like these.